তবু তাঁর প্রসঙ্গ কি এড়ানো সম্ভব ? গোড়াতেই দাখিল করা ফিরিস্তির অন্তে এসে চোখ ব্রহ্মতালুতে উঠল বুঝি ? এবং মাত্র দুটি অনুচ্ছেদে খোদ টেনিদা ! Tenida samagra ta pora kintu baki lekhagulo kothay pabo;Asha debi er lekhata somet? একটা গল্পো কিশোর ভারোতী পূজা সংখ্যা তে বেরিয়েছিল টেনিদার. লেখকের নাম ছিল না.ক্রিকেট খেলা নিয়ে. 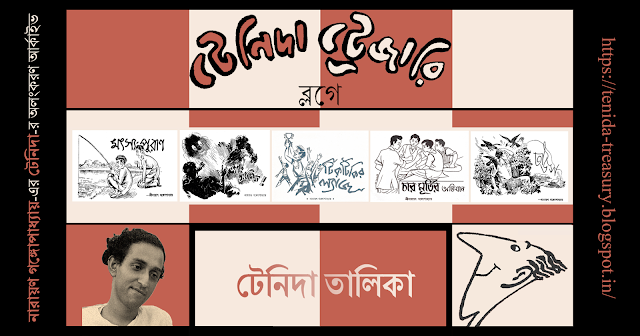 সাল ভুলে গেছি. Saurabh: Please do excuse my first-name address (I am trying to avoid our more familiar "Babu"). What a finely crafted blog! You have made our most beloved Teni-da come alive. I am genuinely gratified that there are those বাঙালি such as yourself who are preserving our priceless cultural heritage against the impact of time as well as the intrusion of excessive westernization. I simply cannot thank you and your team enough. This is not easy work- simply un-earthing many of the factual and temporal details is challenging enough; moreover, you have presented everything in such heartwarming manner with factoids, connections (such as with Shibram Chakraborty, Shaila Chakraborty and so many others). Please keep this going! Monish Chatterjee, Springboro, Ohio, USA (and inveterate lover of all things বাঙালি). Thanks a million Monish Babu (I'm too old-fashioned to avoid the 'Babu'. Sorry.) ! Unfortunately the response to 'Tenida Treasury' hasn't been particularly encouraging. আমি জানতাম আমি টেনিদা - পোকা ; কিন্তু পোকার ও পোকা হয় !! !